Tajikistan, riven by civil war for much of its history since becoming idependent from the Soviet Union in 1991, has the highest rate of poverty of the 15 former-Soviet Republics. 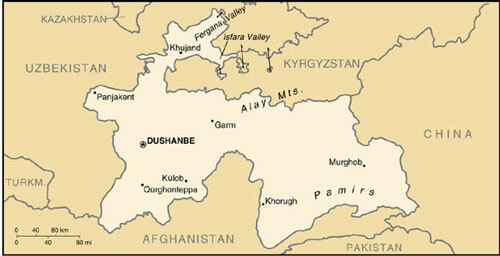 United Nations estimates show that 83 percent of Tajiks live in poverty. Tajikistan has few known oil or gas reserves relying instead on hydroelectric power for 98 percent of its electricity consumption. The country relies heavily on gas imports from Uzbekistan and Turkmenistan. But Tajikistan has had difficulty paying for the gas, and in April, 2001, Uzbekistan threatened to cut supplies if Tajikistan failed to pay. A proposed pipeline connecting oil and gas from the Caspian Sea to the Chinese market would provide Tajikistan with some badly needed revenue. As it stands, Tajikistan is in danger of becoming another failed state. As it stands, Tajikistan is already a major trafficking route for heroin and opiates from Afghanistan going to Russia and Western Europe.